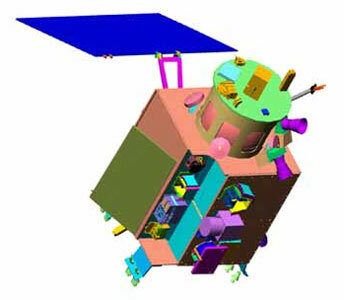 Chardrayaan-1 is the first Indian Mission to the Moon devoted to high-resolution remote sensing of the lunar surface features in visible, near infrared, X-ray and low energy gamma ray regions. This will be accomplished using several payloads already selected for the mission. In addition a total of about 10 kg payload weight and 10 W power are earmarked for proposals, which are now solicited. The mission is proposed to be a lunar polar orbiter at an altitude of about 100 km and is planned to be launched by 2007-2008 using indigenous spacecraft and launch vehicle of ISRO. The mission is expected to have an operational life of about 2 years. Mission Objectives are to carry out high resolution mapping of topographic features in 3D, distribution of various minerals and elemental chemical species including radioactive nuclides covering the entire lunar surface using a set of remote sensing payloads. The new set of data would help in unravelling mysteries about the origin and evolution of solar system in general and that of the moon in particular. A Hyper Spectral Imager (HySI) operating in 400-900 nm band with a spectral resolution of 15 nm and spatial resolution of 80 m with a swath of 40 km, for mineralogical mapping. The hyper spectral camera has 64 channels. A Lunar Laser Ranging Instrument (LLRI), for determining accurate altitude of the spacecraft above the lunar surface for topographical mapping with height resolution of about 10 m.
A High Energy (10-200 keV) X-ray/g-ray spectrometer (HEX) having a ground spatial resolution of approximately 20 km, for measuring 210Pb, 222Rn degassing, U, Th etc. Also a moon impact probe (MIP), which is conceived as a technology forerunner for future lunar landing mission is also being incorporated. Low energy (0.5-10 keV. X-ray spectrometer called Chandrayaan Imaging X-Ray Spectrometer from Rutherford Appleton Laboratory, UK, to measure elemental abundance distributed over the lunar surface using X-ray fluorescence technique. It will also include X-ray solar monitor to record the incident solar X-ray flux. Near Infra-Red (IR) Spectrometer from Max Planck Institute of Aeronomie, Germany, to detect and measure lunar mineral abundances. Sub keV.Atom Reflecting Analyser from Swedish Institute of Space Physics, developed in collaboration with India, to measure volatiles generated due to solar wind impacting on lunar surface and determine the surface magnetic field anomalies. 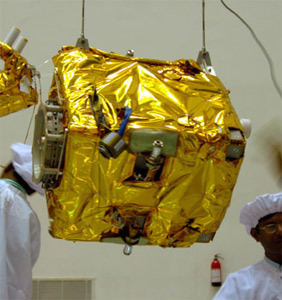 Chandrayaan 1 oprated successfully until August 2009. The Moon Impact Probe (MIP) weighing 29 kg rode piggyback on the top deck of the main orbiter and was released at a predetermined time after the orbiter reached the final 100 km orbit to impact at a pre-selected location. During the descent phase it was in spin-stabilized configuration. The total flight time from release to impact on Moon was close to twenty minutes. The dimension of the impact probe was 375 mm × 375 mm × 470 mm. Mass Spectrometer - A state-of-the-art Quadrupole mass spectrometer with a mass resolution of 0.5 amu and sensitive to partial pressure of the order of 10-15 torr for measuring the constituents of tenuous lunar atmosphere during descent.